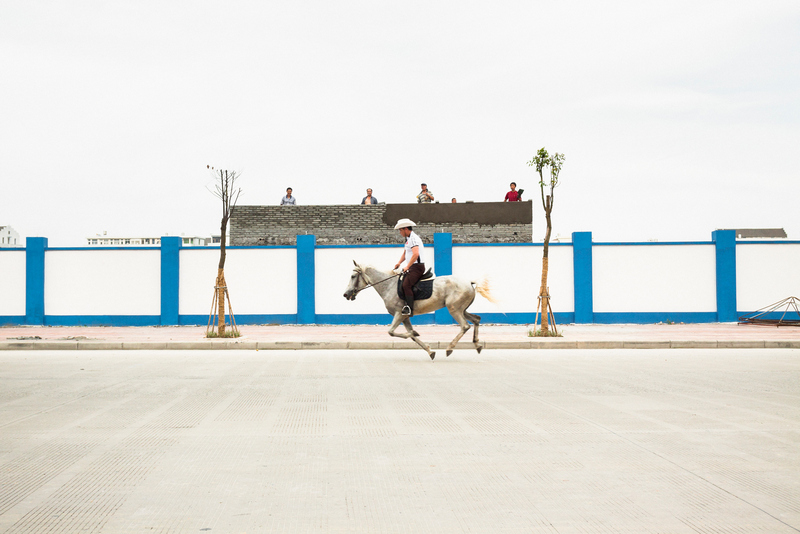 A man rides his racehorse on the street as construction workers look on, in the Shangwang sub-district of Rui’an, June 10, 2011. Rui’an is a county-level city in the south of Zhejiang province, where the photographer grew up and where he made the photographs in this gallery. 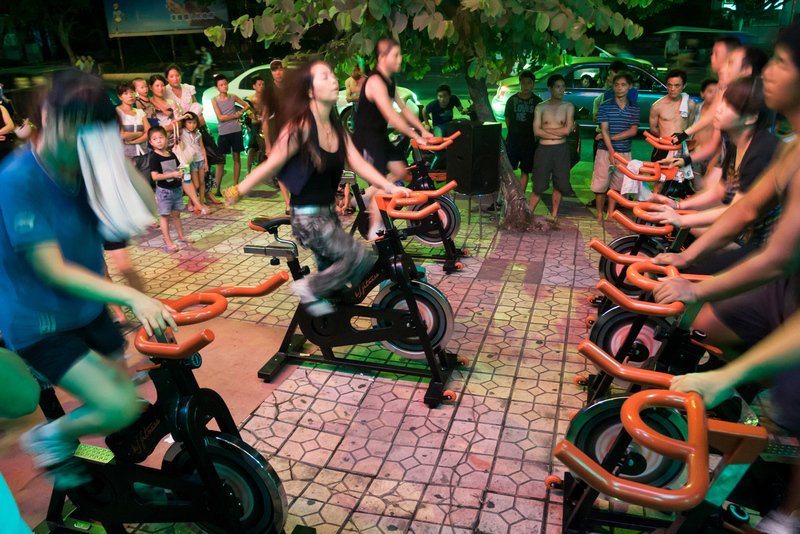 Young people work out at a public fitness facility in Shencheng sub-district, July 30, 2011. 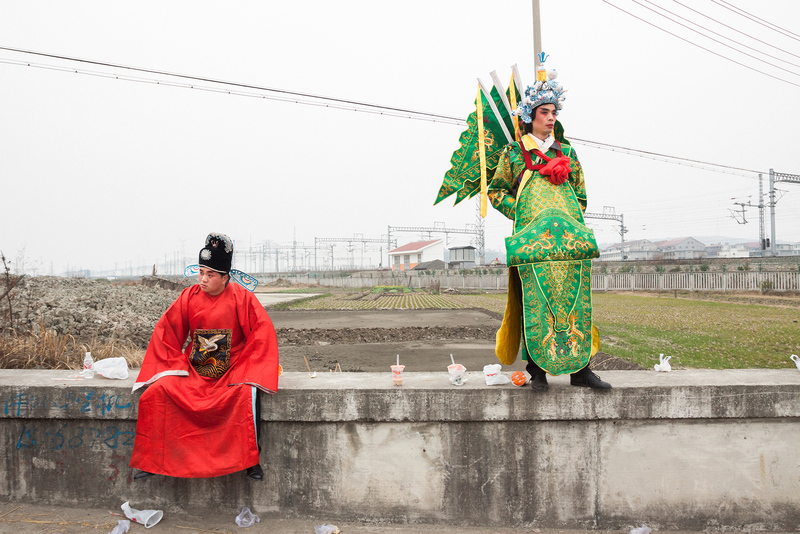 Costumed performers participate in a Spring Festival parade in Taoshan township, February 10, 2011. 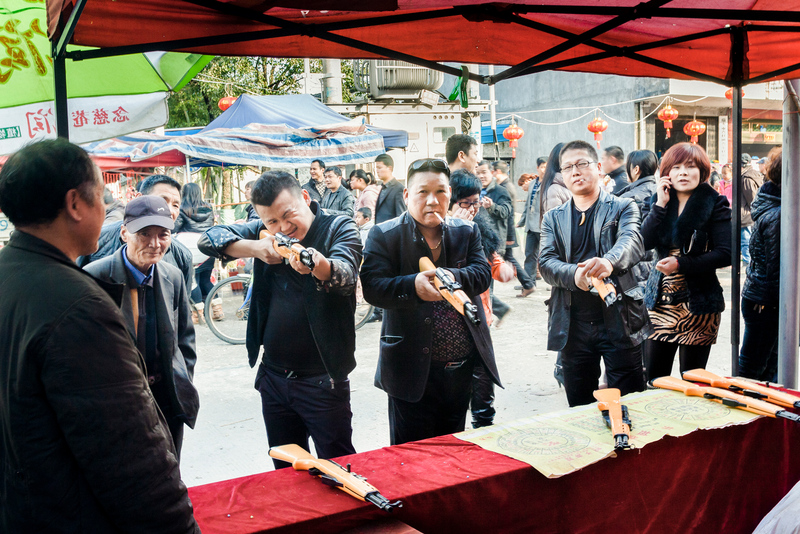 People play with air guns at a Lantern Festival celebration in Ancao village, February 6, 2012. 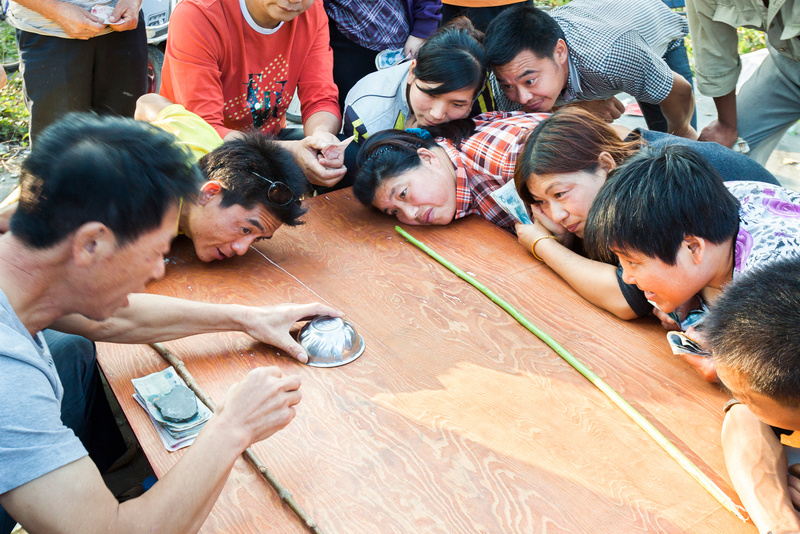 Gamblers bet cash on how many beans are in a bowl in Shencheng, October 5, 2012. 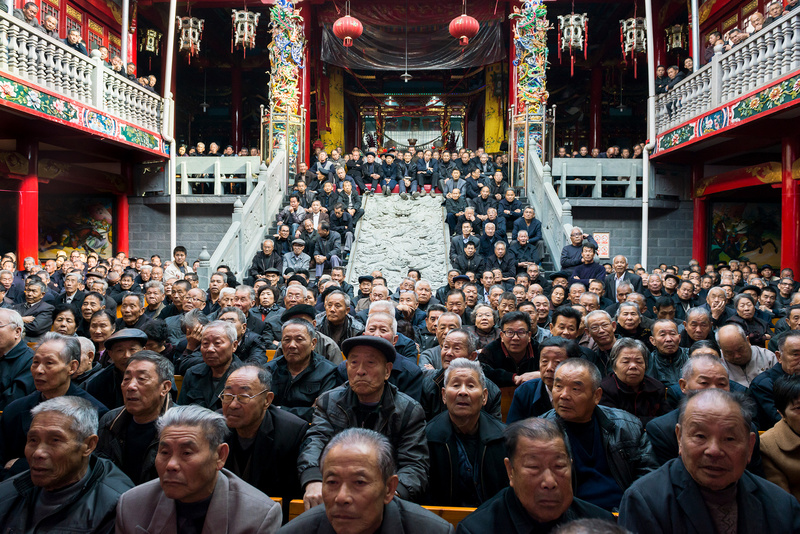 Elderly audience members watch Chinese opera at an ancestral shrine in Tingtian sub-district, November 25, 2013. Villagers play poker at a board-game room in Xi’ao village in Tangxia township, March 17, 2013. 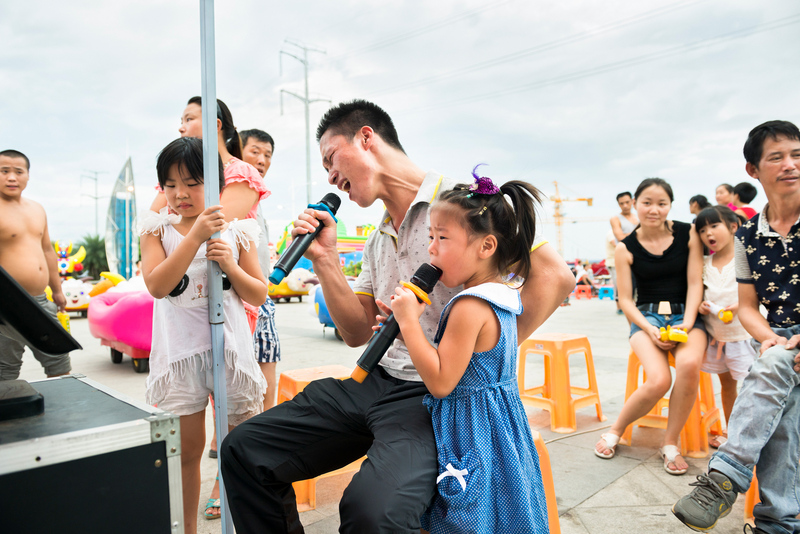 A father and his daughter sing at a mini karaoke booth on the street in Feiyun sub-district, August 1, 2014. 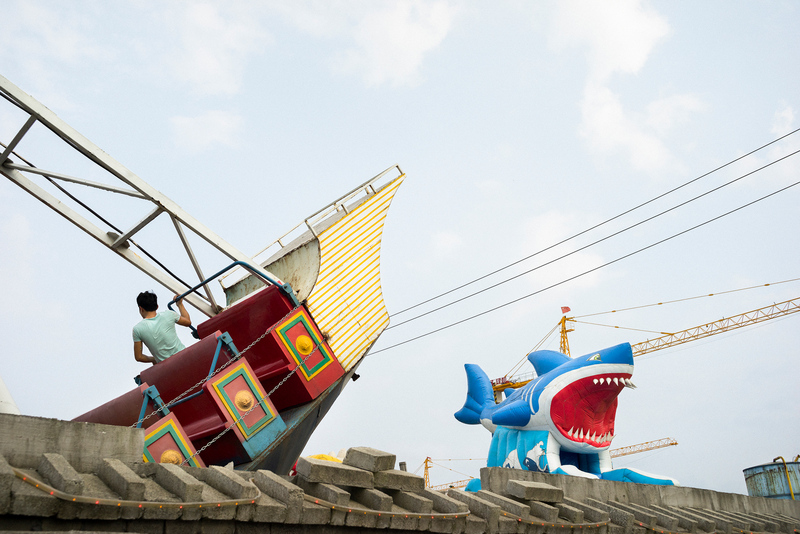 A man enjoys a ship-themed ride at a small amusement park on the former site of a farm in Feiyun, September 8, 2014. A residential complex is under construction beside the park. 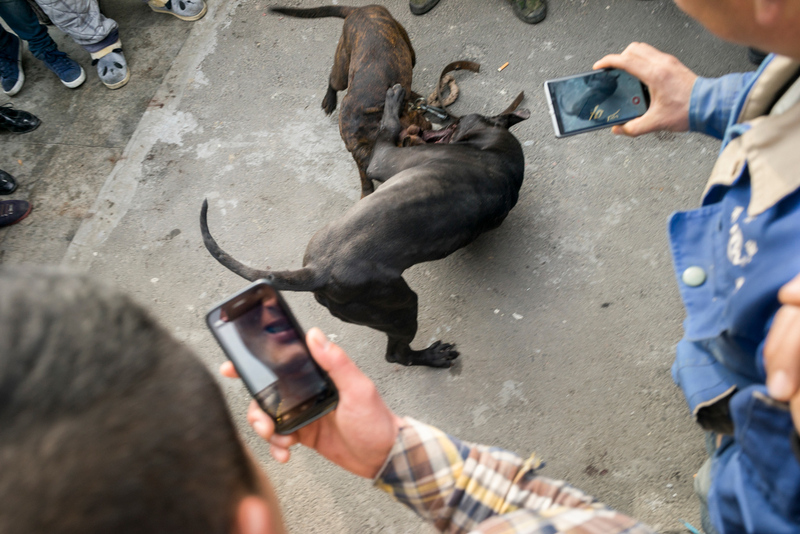 People film a dogfight in Shencheng, February 14, 2015. 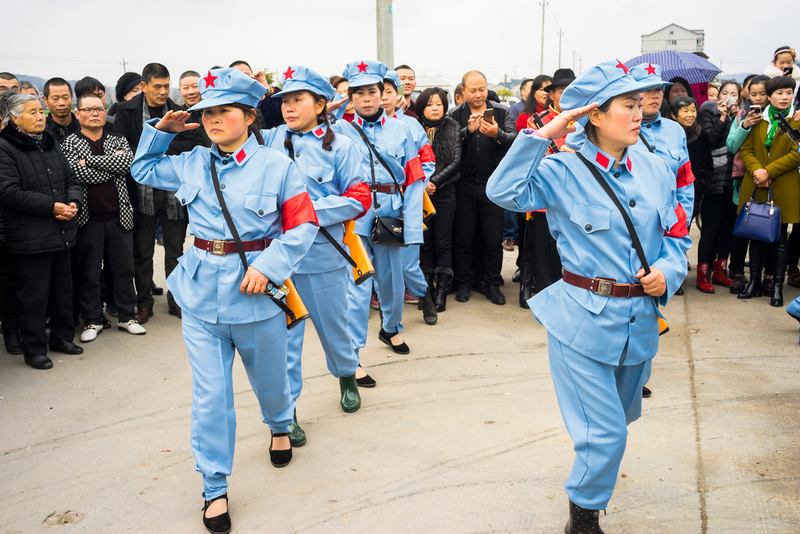 Women wearing replicas of Red Army uniforms perform at a Buddhist ceremony in Taoshan township, February 27, 2015. In order to gain government approval for the ceremony, the organizer added political propaganda elements to the event proposal. 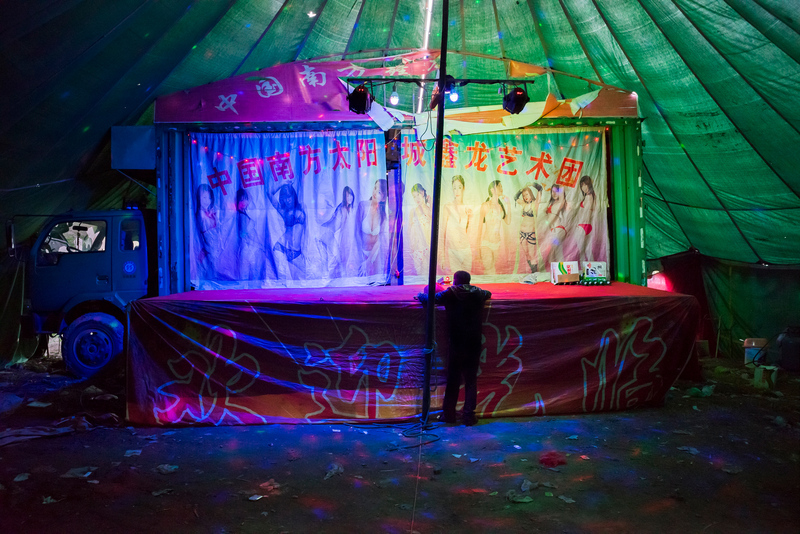 A man waits for a traveling performance group to start its show in Feiyun, March 24, 2015. 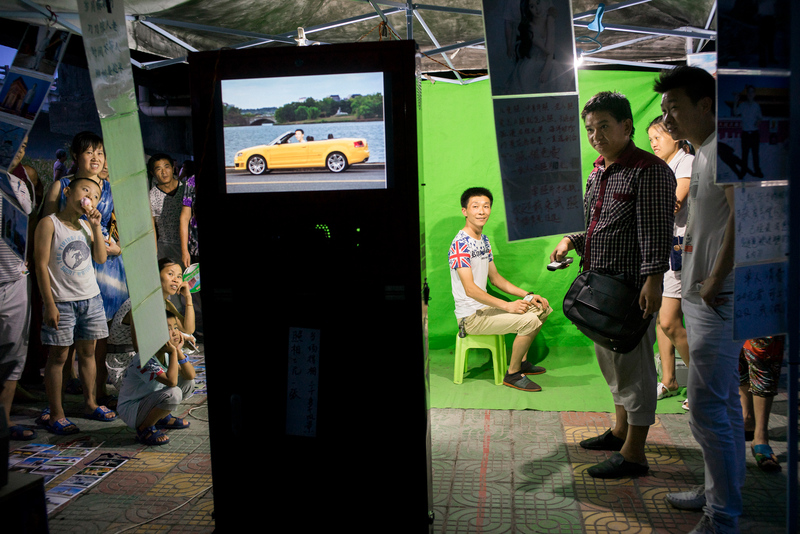 A man sits in front of a green screen at a photo booth where a digitally manipulated image with a simulated background is displayed on a screen, July 17, 2015. 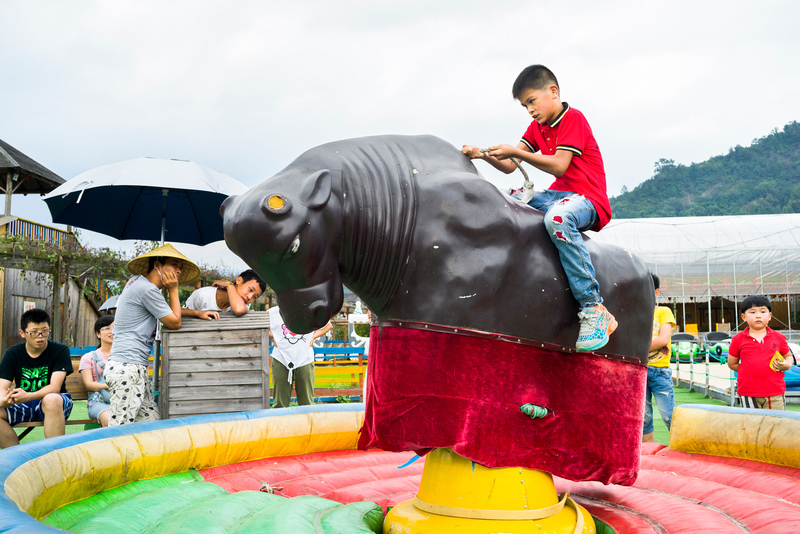 A child rides a mechanical bull at a leisure farm, a type of resort, in Huling township, October 3, 2016. A family plays golf at a farm in Dongshan sub-district, October 5, 2016. 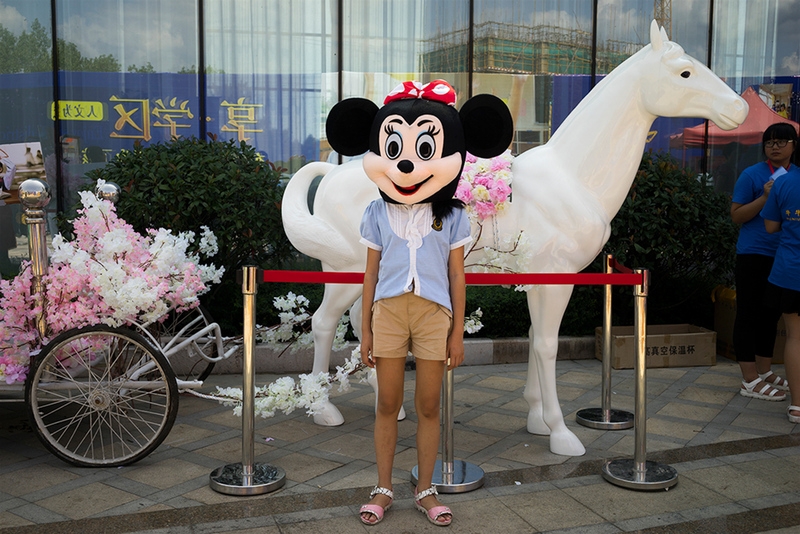 A child wears a Minnie Mouse costume for a photo in Mayu township, October 3, 2016. A real-estate sales center set out the cartoon objects and costumes to attract customers. 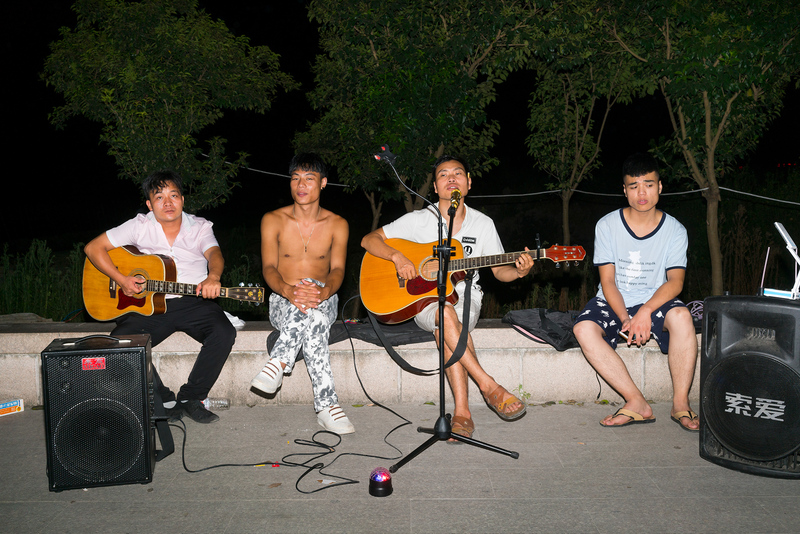 A band plays music on the street in Mayu, July 22, 2017. 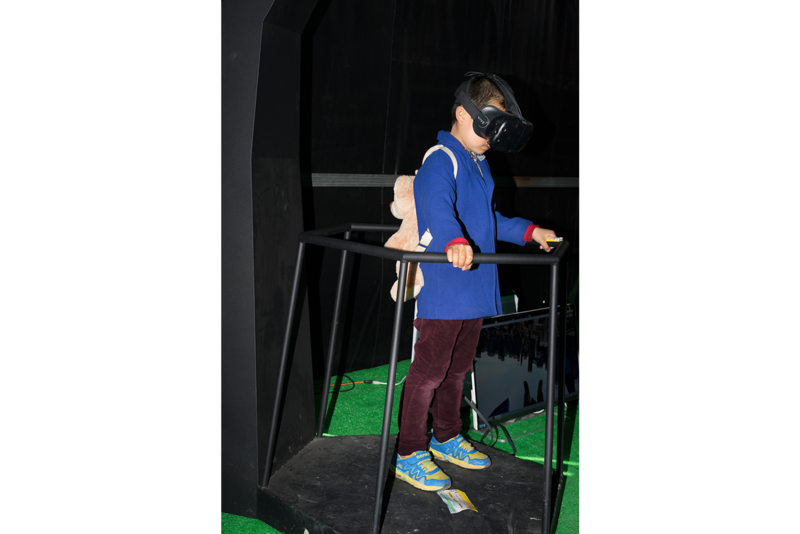 A child tries on a VR headset at a leisure farm in Tongpu township, March 26, 2017. 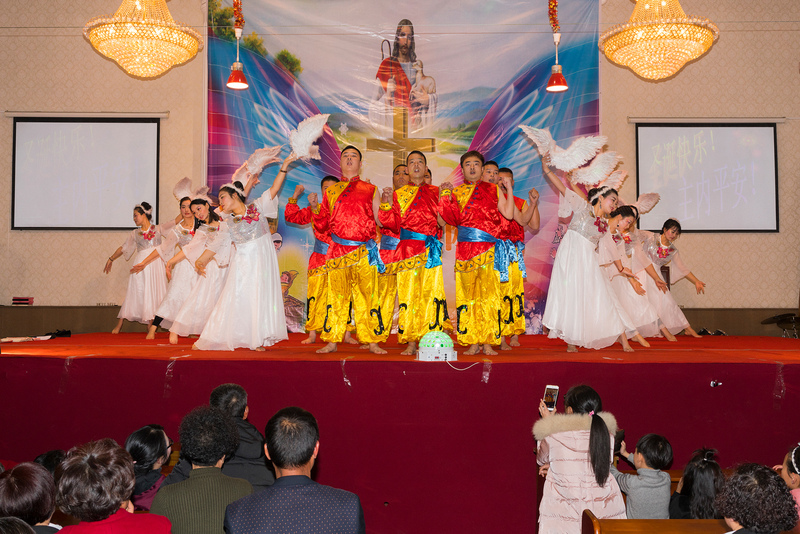 People in costumes perform at a Christmas gala in a Catholic church in Gegang village of Feiyun sub-district, December 24, 2017. 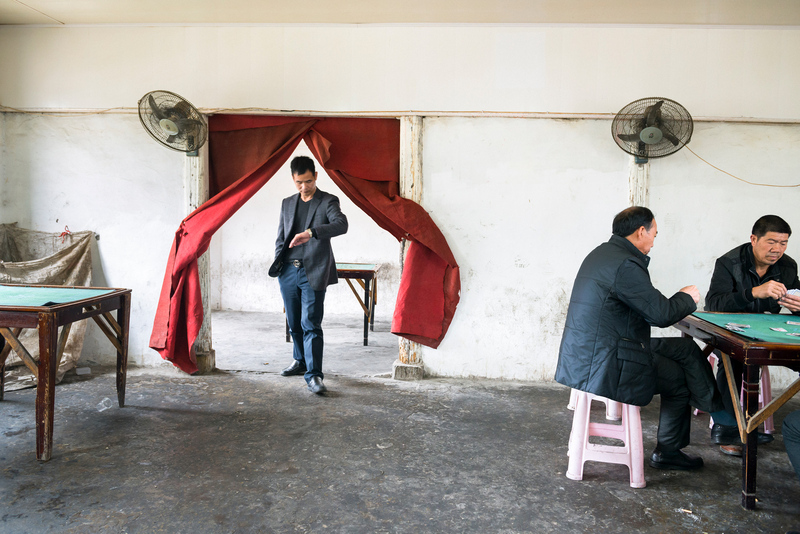 Zhang Xiaowu grew up and has lived his whole life in Rui’an, where he works as a full-time art teacher and a part-time documentary photographer. Located in China’s eastern coastal Zhejiang province, Rui’an used to be predominantly rural. In 1987, as the Reform and Opening policy was taking hold, China’s State Council redesignated the county a “county-level city.” In the years since, consecutive waves of rapid urbanization have swept through the area. Industrial and commercial projects gobbled up farmland. And Zhang, born in 1972, witnessed it all. In 2009, he became interested in trying to depict the changes in his hometown, a place that was deeply familiar and yet had become alienating—a “non-urban non-rural hybrid” where consumerism was wiping out tradition. “The modern countryside is like a giant randomly assembled machine, overloaded and rattling wildly.” He found himself drawn to making images of recreation, the moments when, as he saw it, newly acquired wealth sated longstanding desires.